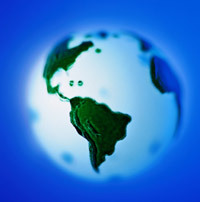 Is the global economy presenting you with some new international business challenges? Maybe you need a market entry strategy or market analysis. Perhaps you're considering outsourcing some of your production, or shifting production from one off-shore area to another. Or maybe you'd just like to have an outside, unbiased, perspective of your current international operations and practices. If so, a team of our second-year MBA's might be able to help you! A team of 3-4 second-year MBA students works with you during spring quarter and presents their findings and recommendations to you in written and oral reports at quarter's end. Participating companies are asked to pay a fee of $2,500 plus pre-approved, project-related expenses. These projects begin on March 31st and will conclude with a written report and oral presentation at your office in late May. Due to the uncertainty of final enrollment, there's no guarantee that we'll be able to provide a team for every project offered. University of Washington MBA students average more than five years of post-undergraduate work experience. Your team members have completed all their MBA core classes as well as other courses in their chosen concentration such as Marketing, Finance, Operations, etc. Their combined experience and MBA training will bring immediate value to your company. Depending on the part of the world in which you have a business interest, we may even have students from that region, or students who speak the language. The class is taught by Raj Rakhra, an experienced and award winning Business School lecturer and former Microsoft program manager with many years of real-world international business experience. The students are also supported in their work by other Business School faculty and staff and by the Foster Business Library and its access to the latest data bases and research tools. A brief description of what you would like to do will get the project started. The student team's first job will be to come to your office to better understand your business and your needs. They will write a detailed work plan that both you and their professor will approve before they start work and then check in and meet with you periodically during the course of the project. The final deliverable is an oral and written report of their findings and recommendations which will be presented late May. Please let me know if there's an area in which we could be of service. Not sure? Give a call and we can talk about it. And if you know of another company who might be interested, referrals are always welcome.